by Michael C. McGoodwin, M.D. Nuclear medicine imaging procedures employing radiopharmaceuticals have been available at Providence Medical Center in Seattle (PMC) for many years. The successful introduction and development of cardiovascular nuclear medicine examinations there required the presence of properly trained and highly motivated physicians as well as the acquisition of recently developed imaging equipment. These procedures are performed in the nuclear medicine division of the radiology department by technologists supervised by radiologists in close cooperation with physicians from the Heart Center. The first director of nuclear medicine at PMC was J. Trenholme Griffin—he also was the director of the radiotherapy section. 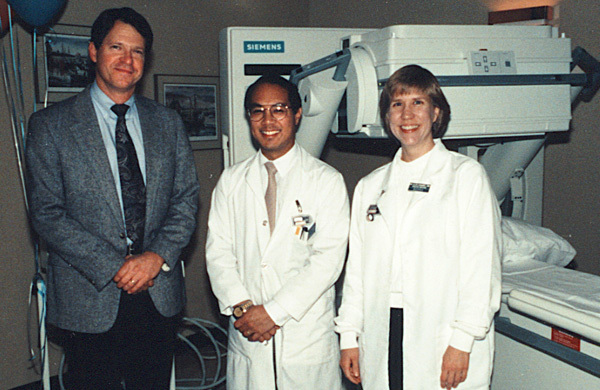 In 1978, I joined the radiology team and in 1979 became the director of the nuclear medicine division, serving in that capacity until mid-1994. My successor as head of nuclear medicine was Sanjiv R. Parikh—he remains the head of nuclear medicine at PMC to this date. In 1978, PMC found itself with an abundance of potentially competing physicians eager to see nuclear cardiovascular imaging services develop and flourish. I had completed diagnostic radiology and nuclear medicine residencies at the University of Washington and received board certification in both fields. I had trained in part with the cardiologist and nuclear medicine specialist Glen W. Hamilton (one of the pioneers in nuclear cardiovascular imaging.) I recognized the importance of this rapidly advancing but relatively new area of nuclear medicine—especially for PMC with its strong emphasis on diagnosis and surgery of cardiac disease. Peter C. Albro and Milton T. English had also recently joined the attending staff of PMC after cardiology residencies at the University of Washington which included research in radionuclide cardiac imaging under Dr. Hamilton. Dr. Albro co-authored publications with Dr. Hamilton on thallium myocardial scintigraphy and the use of oral dipyridamole. Dr. English co-authored publications with Dr. Hamilton demonstrating the relative distribution of technetium-labeled macroaggregated albumin imaged after direct intracoronary arterial injection. The presence of these eager physicians from both cardiology and radiology/nuclear medicine posed an interesting challenge as to how to divide up the responsibilities—a circumstance which proved to be a source of conflict and acrimony at many other institutions. Moreover, professional disagreement between radiology and cardiology at PMC had at times been problematic in the past. Fortunately, an innovative and ultimately quite successful compromise solution was negotiated for nuclear cardiac imaging under the beneficent urging of the then Medical Director, Bruce Gilliland. It was ultimately agreed that the procedures would be physically conducted in the nuclear medicine division and technically controlled, administered, and supervised by me and certain of my radiologist colleagues. The interpretation of the procedures, on the other hand, would be performed jointly by designated radiologists and cardiologists who had established their technical expertise in such interpretation. The co-interpreting team from radiology initially included me, Paul S. Paulson (the director of radiology services), and Gerold F Garrett (the radiology department chairman.) Over the years it has also included William M. Marks, Marie E. Lee (board certified in nuclear medicine), Sanjiv R. Parikh (board certified in nuclear medicine), Jeffrey D. Robinson, and Alex Serra. The cardiologists co-interpreting procedures initially comprised Drs. Albro and English and have subsequently included Fredric M. Tobis and Neal S. Perlmutter. The joint interpretation protocol employed was unique and original to PMC. I designed a worksheet which allowed the first co-interpreting physician present after exam completion to record his/her findings and conclusions. When the second co-interpreting physician arrived, he/she would prepare a report that reflected the opinions of the two co-interpreters, even if the first physician was no longer present. This technique offered essentially two opinions on each case, fortunately most of which were concordant and only occasionally divergent. The referring physicians generally accepted the somewhat more complex reporting scheme resulting from such a heterogeneous team effort, recognizing that some differences of opinion were inevitable. Interpretation fees were shared among the participating parties according to a formula allocating technical and interpretation components. In my opinion, this joint interpretation technique that we pioneered at PMC was one of the major factors contributing to the substantial success, harmony, and acceptance of nuclear cardiac imaging there. When I arrived, it was immediately apparent to me that PMC needed to drastically upgrade its nuclear imaging equipment, in part to facilitate the performance of current generation cardiac imaging procedures. Working with Drs. Paulson and Garrett, Mr. Neal Wilson (the irreplaceable administrative director of the radiology department) and the hospital administration, we arranged for the acquisition of a mobile General Electric gamma camera, the "Datacamera", probably in late 1978. This machine had a 10-inch diameter crystal and was capable of rolling onto the hospital elevators and to the wards for performing "portable" studies where indicated—e.g., cerebral perfusion studies for assessing brain death, infarct-avid imaging, and gated cardiac studies. We offered the mobile imaging service for many years until the transport mechanism became too undependable. This gamma camera had a thin (3/8 inch) sodium iodide crystal and other features that made it optimal for cardiac imaging including the low energy photons imaged in thallium studies. (This camera was disposed of in 1996.) In about 1979, we acquired a 15-inch crystal General Electric gamma camera (the "Maxicamera"). This machine, with its larger field of view and thicker 1/2 inch crystal, became the workhorse in nuclear medicine primarily for non-cardiac imaging, but also was employed for pulmonary ventilation and perfusion imaging, radionuclide upper and lower extremity venography, and certain other quasi-cardiovascular imaging procedures. At about the same time as we acquired these cameras, we also acquired the first computer at PMC dedicated to nuclear image processing. We began initially with a Medical Data Systems (MDS) computer and later replaced it with a Technicare/Ohio Nuclear 560 Computer. These computers gave us the ability to acquire and store planar (i.e., non-tomographic) images for subsequent processing, image enhancement, quantitative analysis, off-line storage, etc. In 1991 we acquired a Siemens large field of view (LFOV) "Diacam" gamma camera system capable of performing Single Photon Emission Computed Tomography (SPECT). Integral to this system was a DEC VAX-based minicomputer linked to the Diacam camera through a Siemens "MaxDelta" computer—these computers were used for camera control, image acquisition, and image processing. The Maxicamera was interfaced to the Siemens computer system through another image acquisition computer, the "MicroDelta". In 1993 we also obtained a Macintosh-derived physician workstation which facilitated interpretation and demonstration of studies to attending physicians and house staff. It is my understanding that PMC has recently replaced the non-digital Diacam SPECT system with a digital Siemens Diacam SPECT system and has replaced the GE Maxicamera with a dual head LFOV "ECam" Siemens SPECT system, the latter now serving as the principal camera for cardiac imaging. A treadmill has also been added to the nuclear medicine department since 1994 to allow in-department exercising of the patient. Our first lead technologist at PMC involved with the development and implementation of cardiac imaging procedures was Martin Daly—subsequent lead technologists who were instrumental in development of nuclear cardiovascular imaging included Jan Wilkinson, Mary Gagnon and Clifford C. Lee. I am very grateful for the hard work, determination, and professionalism exhibited by these and by the other fine nuclear medicine technologists I had the privilege to work with at PMC. The latter have included Jennifer Thompson Prekeges, Gail Albert McFarland, Melissa Baker, Gary Archer, Marylee Daller, and Sue Ellen Paananen. In the procedure descriptions that follow, I have provided brief summaries even for examinations which are today common garden-variety procedures well known to the current practitioner. This is primarily for the benefit of individuals reading this document in the future who may be less familiar with them perhaps because of intervening obsolescence and further progress. I have also included some of the procedural changes made since I left there in 1994, where known to me, but I have emphasized the early development of nuclear cardiovascular imaging. Historically, this was one of the first nuclear cardiac imaging procedures developed (in the mid 1970s) and we promptly offered it when suitable equipment was available, namely the 10-inch GE gamma camera. Its discovery depended on the fortuitous observation that some bone scan imaging studies demonstrated uptake of the radiopharmaceutical in injured soft tissues, most dramatically those exhibiting dystrophic calcification. When patients with acute myocardial infarction were studied with the bone-scanning radiopharmaceutical, technetium-99m pyrophosphate, it was found that some of the infarcts took up the tracer, maximally at 48-72 hours post-infarct. The technique could not demonstrate old healed infarcts and the sensitivity even for acute infarcts was not high. Moreover, determining the location of the rather amorphous uptake could be difficult, since there was no delineation of normal myocardium. False positives occurred from valve calcification, rib lesions, aneurysms, and other lesions. Nevertheless, this examination could at times provide impressive verification of recent infarcts, particularly the then difficult to diagnose inferior or diaphragmatic and right ventricular infarction, and in patients with ECGs confounded by conduction abnormalities or previous myocardial infarction. It is no longer performed. In this procedure the patient&'s own blood was labeled with a tracer that persisted in the bloodstream for long enough to allow imaging the so-called blood pool (blood in the major intravascular spaces) without significant obscuring extravascular accumulation. Although various labeling methods were explored, the most successful and enduring technique has been to label the patient&'s red blood cells with technetium aided by stannous pyrophosphate. Blood pool imaging had previously been used with ungated planar imaging, for example as a rather crude means of demonstrating cardiac chamber size and large pericardial effusions (a technique later supplanted by echocardiography). The gating technique requires the use of a computer linked to an ECG signal and makes the assumption that the cardiac chambers will assume the same shape, size, and spatial position at equal intervals from the R-wave during each cardiac contraction cycle. This technique has also been termed Multiple Gated Acquisition (thus, a "MUGA" study.) The sequential images can be viewed in a perpetually recycling loop to allow for the visual detection of segmental wall motion abnormalities (usually from infarction, sometimes stunning), chamber enlargement, etc. The computer is used not just to acquire the image frames over short segments of the cardiac cycle (typically 40 msec) but also to provide edge detection and other quantitation software techniques. By use of semi-automated edge detection, the technique became relatively independent of operator intervention and therefore more reproducible. Although a variety of quantitative indices could be derived from computer image analysis, by far the most useful proved to be the estimate of left ventricular ejection fraction (LVEF). This single measure has strong prognostic significance and has been widely used, for example, in assessing the patient&'s appropriateness for surgery or the effect of myocardial infarction on overall function. LVEF measurement by GECBPS is relatively insensitive to chamber geometry since the activity observed in the LV chamber is, to the first approximation, proportional to the blood volume regardless of chamber shape, and the taking of the ratio of systolic and diastolic activity further diminishes the effect of variations of shape. Moreover, although image acquisition over multiple cardiac cycles potentially causes some image smearing, it also provides the advantage of averaging contraction data over multiple cycles (about 300 to 500), thereby giving a better statistical estimate of ejection fraction. Right ventricular function can be visually assessed, but quantitation of RVEF is not as successful as LVEF due to substantial overlap by the right atrium. We were able to offer GECBPS at the bedside where indicated while we still had the mobile gamma camera and mobile computer. Most GECBPS was done with the patient recumbent and at rest. However, we eventually acquired a bicycle ergometer for the purpose of also allowing the performance of GECBPS while the patient performed graded exercise. This technique was described in the literature as particularly useful for detecting declining left ventricular functional reserve in patients with aortic regurgitation. A failure of the LVEF to increase by at least 5% between rest and exercise was considered significant. The method could also demonstrate exercise-induced segmental wall motion abnormalities. It was rather elaborate, time-consuming, and expensive to perform, however, and imaging during exercise was not always ideal due to chest motion. The procedure enjoyed only limited utilization, presumably being supplanted by echocardiography and other techniques. It is my understanding that GECBPS studies in general have continued to taper off in utilization since 1994 and that exercise gated studies are no longer performed. Historically, this technique probably preceded GECBPS. We offered it at PMC but were only occasionally asked to perform it. The patient was injected in an antecubital vein with a technetium agent (usually the same as used for subsequent GECBPS) and sequential images were acquired by the computer as the tracer passed first through the right heart, and then the left heart. Quantitative image analysis required a greater degree of computer sophistication (e.g., "gamma variate analysis") than GECPS and the images lacked the high counting statistics that the former offers. Nevertheless, it was the only way to display the right and left cardiac chambers scintigraphically without overlap. It enjoyed limited success in the early years particularly for estimating RVEF and demonstrating right to left shunts. These studies are apparently no longer performed at PMC. Unlike infarct-avid myocardial imaging, imaging with 201-thallium depends on uptake by the normal myocardium of thallous ion ( a potassium analogue). Thallium imaging in its various forms has been a mainstay of nuclear cardiac imaging since the late 1970s. Other intravenous tracers for myocardial imaging were developed in the 1980s, particularly certain technetium-labeled agents taken up by normal myocardium such as sestamibi (i.e., MIBI, Methoxyisobutyl Isonitrile, or Cardiolite) and teboroxime (Cardiotec). The technetium agents are especially useful if the patient is quite large or has large breasts, preventing satisfactory imaging of the low-energy thallium photons. They also make possible the combining in close succession of resting thallium with exercise technetium imaging on the same day (the "Dual Isotope" technique). There are some possible disadvantages to sestamibi—it potentially underestimates the extent of viable but hibernating myocardium and may also underestimate the extent of ischemia. For these and other reasons, up to 1994 at least I preferred to employ predominantly thallium for most myocardial studies and to reserve sestamibi for the problem patient with large breasts, etc. It is my understanding that most stress studies at PMC are now employing the dual isotope technique rather than thallium alone, and that resting sestamibi imaging will soon be employed for emergency department patients to assist in the evaluation of suspected myocardial infarction. Thallium studies performed soon after injection of the patient at rest allowed the demonstration of normal versus infarcted myocardium. Thallium studies performed soon after injection of the patient at maximal exercise allowed the demonstration of normal versus ischemic and/or infarcted myocardium. Because of the unique properties of thallium, it is often desirable to obtain additional delayed ("redistribution") views at 2, 4 or even 24 hours (redistribution does not occur significantly with sestamibi.) Delayed imaging allows the "filling in" of uptake by initially ischemic (or "hibernating") myocardium and thereby the differentiation from infarcted myocardium. Patients with resting ischemia could also be re-imaged after a delay of a few hours from injection at rest and would occasionally demonstrate additional redistribution uptake. For many years, the patients were exercised on a treadmill in the Heart Center under the supervision of a cardiologist or physician assistant, injected just before discontinuation of maximal exercise, and then rushed to the nuclear medicine department in the basement for initial acquisition of the exercise images. I understand that there is now a treadmill in nuclear medicine, allowing the patients to be exercised, injected, and imaged all in the same location. Thallium studies performed with planar imaging were of value but somewhat limited in sensitivity and could also not be quantitated. The advent of SPECT imaging of thallium examinations provided higher sensitivity and accuracy and the ability to provide quantitative polar ("bulls-eye") maps of the relative distributions of uptake compared to a normal population database, a visual aid to understanding which appealed to referring clinicians. I understand that these polar maps have been discontinued now that dual isotope studies are being performed, as there is no readily available standardized population database on which to base them. SPECT examinations, compared to planar imaging, require an increased vigilance regarding technical issues to prevent artifacts. The alternative of pharmacologically-induced coronary vasodilatation ("pharmacologic stress") was introduced for patients unable to undergo adequate exercise stress, for example with arthritis or other debilitating conditions. This technique utilized intravenous injection of either dipyridamole (persantine) or adenosine, or in a few cases dobutamine, followed soon thereafter by the thallium (or sestamibi) injection and initial imaging soon thereafter. Since the patient did not require a treadmill for this type of examination, they were injected and imaged in nuclear medicine, under a cardiologist&'s or nurse&'s supervision. These coronary vasodilators increase blood flow through normal coronary branches, whereas vessels with significant stenoses do not increase distal perfusion to the same extent, despite the lowering of distal resistance produced by these drugs. Thus a pattern of uneven perfusion becomes apparent with this examination: the myocardium perfused by the stenotic vessel exhibits less relative perfusion whether or not the patient actually experiences symptomatic ischemia from the injection. With the increased sensitivity of exercise thallium or sestamibi SPECT examinations, it became increasingly desirable and necessary for interpreting physicians to correlate them with the results of coronary angiography. The angiogram and ventriculogram could show detailed coronary anatomy and stenoses, as well as ventricular function at rest but could not always accurately predict the degree of end-organ effect (i.e., myocardial ischemia) produced by these stenoses when the patient was subjected to maximal exercise stress. Moreover, the thallium or sestamibi study could sometimes demonstrate a region of apparent perhaps mild ischemia supplied by a vessel lacking an angiographically "significant" stenosis (though some degree of stenosis was often apparent). I greatly enjoyed working closely with my cardiology and surgical colleagues in attempting to correlate and resolve discrepancies in the subtle findings of these two complementary diagnostic modalities. There was no other examination for which close cooperation between the Heart Center clinicians and the interpreting physicians was so essential. We promptly instituted radionuclide venography of the lower extremity upon the acquisition of the 15-inch gamma camera. This technically demanding procedure, partly pioneered at the University of Washington, involved injecting the tracer (typically the lung perfusion imaging agent technetium-MAA) in a dorsal foot vein with ankle tourniquets applied, and then imaging its course through the deep veins of the leg, the external and common iliac veins, and the inferior vena cava. It does an excellent job of demonstrating acute major deep vein obstructions (as manifested by the abnormal filling of collateral pathways) and unusual collateral pathways resulting from chronic or acute obstructions. However, it could not always distinguish acute from chronic obstructions, did not always show non-occlusive clots, and could produce misleading results when nearby collateral veins simulated the course of blocked deep veins. The technique was also useful in some instances for evaluating possible upper extremity or superior vena cava obstructions, though gradually supplanted by magnetic resonance imaging and other modalities. The utilization of this procedure had tapered off by 1994 and I understand that it is no longer performed at PMC. This procedure has always been one of the major nuclear medicine techniques involving the cardiovascular system. It was improved significantly when we routinely added eight-view perfusion imaging as the routine standard and also when xenon ventilation imaging was replaced with aerosolized technetium DTPA ventilation imaging, also incorporating eight views. Gallium scintigraphy had some success in demonstrating the inflammatory component of pericarditis as well as in demonstrating infections following cardiovascular surgery. By the early 1990s, it had been largely supplanted by Indium-111 labeled leukocyte imaging. Direct intracoronary injection of technetium MAA was not attempted to my knowledge at PMC, though intra-arterial injection and imaging was performed a few times in other arterial distributions, particularly the hepatic bed. There were few areas of medical diagnostic imaging in the 1980s and early 1990s which presented the same degree of challenge and complexity as did the implementation and development of nuclear cardiovascular imaging procedures. It was a privilege to have been a part of this proud achievement at Providence Medical Center and to have had the association I enjoyed with my coworkers and colleagues in radiology and the Heart Center. I am grateful for the review of this document by Paul S. Paulson and for his approval of its general content, as well as the assistance of Clifford C. Lee regarding the current status of examinations at Providence Medical Center, Seattle. I also wish to acknowledge my long and fruitful association with Drs. English and Albro, as well as my radiology colleagues, in making nuclear cardiac imaging a success at PMC.